Name Variation George Jenaman was also known as Juneman. George Jenaman was born in November 1885 at Wisconsin. [S245] U.S. Federal Census 1900 U.S. Federal Census, by Ancestry.com, ED47. Dwelling 104. Name Variation Michael Jenaman was also known as Juneman. Michael Jenaman was born in October 1887 at Wisconsin. Married Name Her married name was Juneman. Married Name Her married name was Jenaman. Elizabeth (?) married (?) Jenaman. Elizabeth (?) was born circa 1796 at Prussia. Name Variation (?) Jenaman was also known as (?) Juneman. (?) Jenaman was born at Prussia. (?) Jenaman died before 1880. Ludolph Reese married Johanna Fredricka Stender. Ludolph Reese was born on 15 April 1829 at Germany. Johanna Fredricka Stender married Ludolph Reese. Johanna Fredricka Stender was born on 17 June 1841 at Germany. John Hoffman was born in July 1848 at Germany. He married Gertrude M. Wisbaum, daughter of Nicholas Wisbaum, circa 1875. Clara Hoffman was born in August 1890 at Wisconsin. 1 June 1905 Smelser, Grant, Wisconsin Clara Hoffman is listed as sister-in-law on the census of 1 June 1905 in the household of John R. Hamilton at Smelser, Grant, Wisconsin. Married Name 9 August 1928 As of 9 August 1928,her married name was Hamilton. Florence Mary Reese was born on 4 April 1909 at Grant, Wisconsin. She married Harold P. Hamilton, son of John R. Hamilton and Anna Hoffman, on 9 August 1928 at Galena, Illinois. Florence Mary Reese died on 9 November 2000 at age 91 Florence (Reese) Hamilton obituary. She was buried after 9 November 2000 at Hillside Cemetery, Lancaster, Grant, Wisconsin. Florence Mary Reese obtained US Social Security Card at Wisconsin; last residence Platteville, Grant, Wisconsin. [S250] U.S. Federal Census 1930 U.S. Federal Census, by Ancestry.com, Year: 1930; Census Place: Smelser, Grant, Wisconsin; Roll: 2574; Page: 8B; Enumeration District: 51; Image: 764.0; FHL microfilm: 2342308. [S373] U.S. Federal Census 1940 U.S. Federal Census, by Ancestry.com, Year: 1940; Census Place: Potosi, Grant, Wisconsin; Roll: T627_4481; Page: 16B; Enumeration District: 22-46. Name Variation Rosella May Hamilton was also known as Rosie. Married Name 5 August 1952 As of 5 August 1952,her married name was Fritsch. 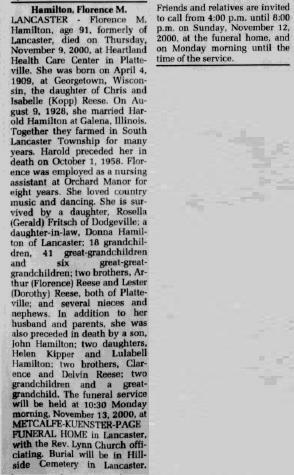 Rosella May Hamilton was born on 21 May 1929 at Smelser, Grant, Wisconsin. She was the daughter of Harold P. Hamilton and Florence Mary Reese. Rosella May Hamilton married Gerald Fritsch on 5 August 1952 Rosella Hamilton and Gerald Fritsch wedding announcement. 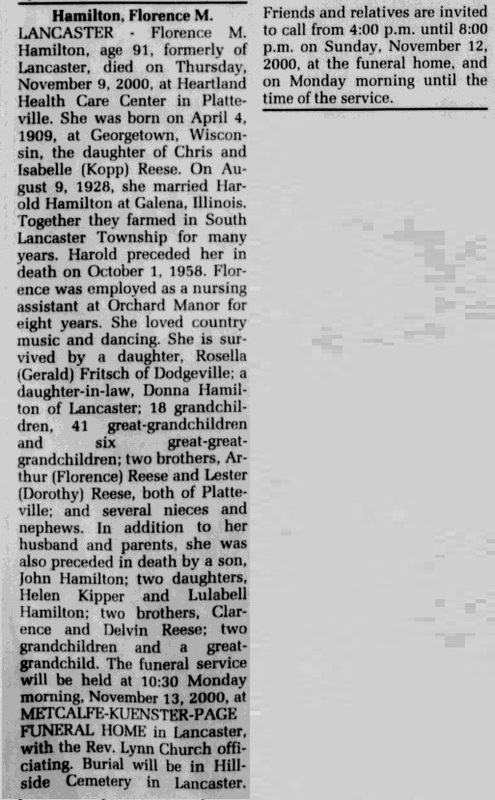 Rosella May Hamilton died on 16 January 2003 at age 73 Rosella (Hamilton) Fritsch obituary. She was buried on 20 January 2003 at Calvary Cemetery, Cobb, Iowa, Wisconsin. Married Name Her married name was Linkscheid. Name Variation Elizabeth Stone Mueller was also known as Eliza. Married Name Her married name was Lingscheid. Elizabeth Stone Mueller married Anton Lingscheid. Elizabeth Stone Mueller was born circa 1808 at Baden, Germany. She died in January 1885. Elizabeth Stone Mueller and Anton Lingscheid immigrated in 1844. [S249] U.S. Federal Census 1850 U.S. Federal Census, by Ancestry.com, Dwelling 590. [S248] U.S. Federal Census 1860 U.S. Federal Census, by Ancestry.com, Page 38. Dwelling 310. [S247] U.S. Federal Census 1870 U.S. Federal Census, by Ancestry.com, Page 31-32. Dwelling 231. [S246] U.S. Federal Census 1880 U.S. Federal Census, by Ancestry.com, NA Film Number T9-1427 Page Number 351A. Name Variation Francis Nichols was also known as Nicholas. Name Variation Francis Nichols was also known as Francois. Francis Nichols married Mary Ann Auberla before 1834. Francis Nichols died before 1845. Sophia Nichols was the daughter of Francis Nichols and Mary Ann Auberla. Mary Nichols was the daughter of Francis Nichols and Mary Ann Auberla. Theodore Nichols was the son of Francis Nichols and Mary Ann Auberla. Edward Nichols was the son of Francis Nichols and Mary Ann Auberla. Married Name circa 1913 As of circa 1913,her married name was Burkett. Margaret Hoff was born circa 1892 at Iowa. She was the daughter of Nicholas Hoff and Anna Riechstoffer. Margaret Hoff married Bennie Burkett, son of Lorance Burkett and Frances Barndt, circa 1913. [S243] U.S. Federal Census 1920 U.S. Federal Census, by Ancestry.com, ED123. Dwelling 59. [S250] U.S. Federal Census 1930 U.S. Federal Census, by Ancestry.com, ED21. Dwelling 210. Name Variation Veneta Burkett was also known as Venita. Veneta Burkett was born circa 1919 at Iowa. She was the daughter of Bennie Burkett and Margaret Hoff. Mercedes Burkett was born circa 1921 at Iowa. Name Variation Nicholas Hoff was also known as Nick. Nicholas Hoff married Anna Riechstoffer. Nicholas Hoff was born circa 1855 at Germany. Name Variation Anna Riechstoffer was also known as Reisdorffer. Name Variation Anna Riechstoffer was also known as Reistroffer. Married Name Her married name was Hoff. Name Variation Anna Riechstoffer was also known as Reistoffer. Anna Riechstoffer married Nicholas Hoff. Anna Riechstoffer was born circa 1861 at Iowa. John Hoff was born circa 1881 at Iowa. He was the son of Nicholas Hoff and Anna Riechstoffer. Susan Hoff was born circa 1900 at Iowa. Ben Hoff was born circa 1901 at Iowa. Amelia B. Pluemer was born in January 1882 at Wisconsin. She was the daughter of Peter John Pluemer and Sophia M. Kirkenbush. Amelia B. Pluemer was a bridesmaid at the wedding of Rosalie Friesen and Leo Joseph Pluemer on 15 October 1907; Leo J Pluemer and Rosalie Friesen marriage announcement. [S245] U.S. Federal Census 1900 U.S. Federal Census, by Ancestry.com, ED51. Dwelling 188. [S244] U.S. Federal Census 1910 U.S. Federal Census, by Ancestry.com, ED43. Dwelling 152. Leo Joseph Pluemer was born on 19 April 1885 at Wisconsin. He was the son of Peter John Pluemer and Sophia M. Kirkenbush. Leo Joseph Pluemer married Rosalie Friesen on 15 October 1907 Leo J Pluemer and Rosalie Friesen marriage announcement. On 12 September 1917 at World War I Draft Registration, Grant, Wisconsin. Louis P. Pluemer was born on 8 July 1889 at Wisconsin. 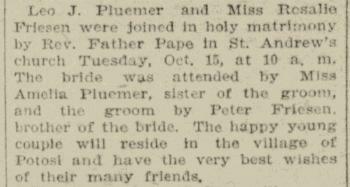 As of June 1917, Louis P. Pluemer was never married. Name Variation Charlotte S. Pluemer was also known as Jo Lotta. Name Variation Charlotte S. Pluemer was also known as Charlotta. Charlotte S. Pluemer was born in April 1893 at Wisconsin. Name Variation Jolitta B. Pluemer was also known as Leta. Name Variation Jolitta B. Pluemer was also known as Leotta. Jolitta B. Pluemer married Oscar Michael Loeffelholz, son of George Loeffelholz and Matilda Kirchberg, at California. Jolitta B. Pluemer was born in July 1898 at Wisconsin. Lauretta A. Pluemer was born circa 1903 at Wisconsin.